Once again, Scalia tries to seem intellectual, but his bias is as obvious as that of Frankfurter so long ago. After reviewing all the opinions, I defintely side with the dissent, even if we must argue the nonsense that the exclusionary rule only applies to deter the police. I still refuse to follow that casuistry. Breyer nails Scalia on this one. Only Kennedy's swing vote saved this case. Detroit police, executing a search warrant for narcotics and weapons, entered petitioner Hudson's house in violation fo the Fourth's "knock-and-announce" rule. Saclia downplayed the violation as unworthy of exclusion, using a balance of deterrence versus societal cost. Scalia also upplays the ineffective remedies of civil suits and internal police discipline. Scalia also implies some silly 'inevitable discovery" excuse to allow the illegally seized evidence in. Coddling crooked cops seems to be the ultimate consequences of the perversions from precedent of the Nixon-Burger Court. The Court has invalidated any reason for knock-and-announce, which has been a part of common law for centuries. Wilson vs AR (1995) serves as futilely as Wolf vs CO (1950), in which the Court agreed that the search violated the Fourth, but refused to exclude the evidence. Like the attempt last year to run around Miranda with MO vs Siebert, Scalia is finding excuses for the police to violate the law, then try a second time to seize evidence. Kennedy swings this travesty just barely. The very fact that he qualifies Scalia's downplay of the violation and the use of exclusion only furthers my contention. He doesn't follow the Court's examples of Segura and Harris, only Ramirez, not finding the test of a "suffient causal relationship" between the unlawful conduct and the discovery of evidence. Kennedy obviously doesn't want to get into defining just what violation of knock-and-announce warrants exclusion. The opinion departs significantly from the precedents from Weeks and weakens the value of the Constitution's knock-and-announce protection. Wilson vs AR (1995) traces the lineage of knock-and-announce back to the thirteenth century. Ther was little doubt the Framers of the Fourth thought that the method of entry into a dwelling was among the factors considered in assessing the reasonableness of the search and seizure. Common law "knock-and-announce forms a part of reasonableness inquiry, so a search and seizure of a dwelling might be constitutionally defective if officers enter without prior announcement. The exclusionary rule from Weeks made it necessary for the protection of the Fourth to be secure against illegal searches and seizures. Silverthorne (1920) qualified the exclusionary rule if such evidence comes to light from independent and legal sources. Mapp held that "all evidence obtained by searches and seizures in violation of the Consitution is, by that same authority, inadmissible in state court." "Social costs" apply only to any exclusion. The majority's "substantial social costs" argument is an argument against the exclusionary rule itself! The constituional violation was not a but-for cause. The illegal entry necessarily allowed seizure. The discovery of evidence was a foreseeable consequence. There is no inevitable discovery in either Silverthorne nor in Nix vs Williams (1984). Inevitable discovery Murray (1988) requires evidence be discovered through a later lawful seizure, genuinely independent of an earlier, tainted one. Segure (1984) had evidence discovered during a search conducted under a valid warrant; the product of that search was wholly unrelated to prior unlawful entry. Murray had similar occasion in which the later acquision was not the result of the earlier entry. The warrant was ordinary, so it authorized a search that complied with, not disregarded, the Consitution's knock-and-announce rule. Interests underlying the rule do not control. 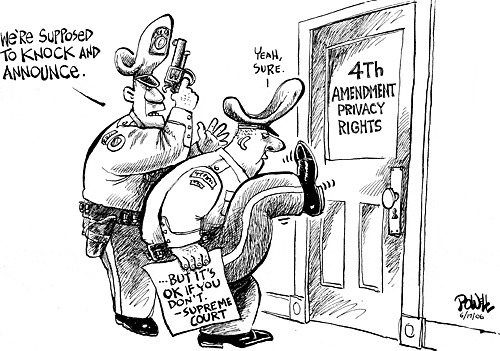 The exclusionary rule protects more general privacy valued through deterrence of futural police misconduct. James vs IL (1990). The interest-base approach departs from prior law. Suppression cannot use causal relationships, without threatening the workablility of exclusion. In other words, limiting exclusion by proving police deliberately violated the search law. The rule does not require police to knock or announce, if police have a "reasonable suspicion" would be dangerous or futile or would inhibit "the effective investiagtion of a crime." Therefore, the prosecution should have argued either for no-knock or exigence. Segura had a warrant lawfully obtained. There was no such independent event to purge the illegal entry. The Court refuses to apply the exclusion which impairs governmental incentive to comply with Fourth requirements. Harris was arrested with only probable cause at home. The trial court excluded statements at home and a videotaped interview. The Court allowed a written statement at the stationhouse, because the statement was not the fruit of where the arrest was made. The warrant requirement protects the home and anything incriminating gathered from the arrest by exclusion. Ramirez doesn't help either, for the entry is unlawful. There the destruction of property occurred during a lawful entry. In other words, Scalia makes the excuse that such an illegal entry does not invoke exclusion because the remedy is too severe and does not bear on the legal search. Not only does this rule be absolute, but the Fourth also provides the right of privacy. What part of “shall not” does the Court not understand? Then the Nixon-Burger Court limited the remedy in 1971 (Calandra) to deterring police misconduct. Thus, the Nixon Gang of Four (Warren Burger, Harry Blackmun, Lewis Powell, and William Rehnquist) decided to insult the police and make them the target of the exclusionary rule. Eventually, the Court decided to get into the heads of the police and figure out what deters them. The Independent Source Doctrine would pass in the Warren Court. The exclusionary rule does not extend to any legally seized evidence, even though it might have been seized illegally earlier. The prosecution may use it if it would have been obtained legally otherwise. The Inevitable Discovery is more nebulous, but it also follows that the prosecution may prove that the fruits of an illegal search may have been obtained otherwise legally. The Attenuation Doctrine resulted from the perversion of the exclusionary rule as solely to deter the police. The exclusionary rule did not substitute for lawsuits to return illegally-seized evidence. The most comical application of the deterrence doctrine came in 1987 under IL vs Krull (ill and cruel) in which the Nixon-Rehnquist Court allowed illegally-seized evidence under search laws later proved unconstitutional because the exclusionary rule did not deter legislators! They lost Sandra Day O Connor, a former legislator, but they still had five for the vote. So how are the police going to know a search law is unconstitutional? Blackmun dodged the answer, so legislators may pass illegal search laws and get away with them until the laws are declared unconstitutional. This time police may make illegal stops, and should there be an arrest warrant, they can get away with the illegal stop? So Thomas plods alone to allow the seized evidence (Search incident to arrest is not in question.) because there had been a legitimate arrest warrant on the defendant, even though the stop had lacked “an articulable suspicion” under Earl Warren’s opinion in Terry vs OH (1968). Not only does it violate the Terry rule of “stop and frisk”, but also the longstanding rule of not allowing “the fruit of the poisonous tree”. The stop was illegal; therefore, no admissible evidence. Sonia Sotomayor wrote the major dissent and hints of going back to the original meaning of the exclusionary rule, which predates the FBI. Elena Kagan simply argues along the test of attenuation. The Court finds some excuse to allow evidence obtained from an illegal “stop and frisk” when there is no articulable suspicion. To paraphrase the jargon of Nixon and Reagan, the Court has decided to “coddle crooked cops”. 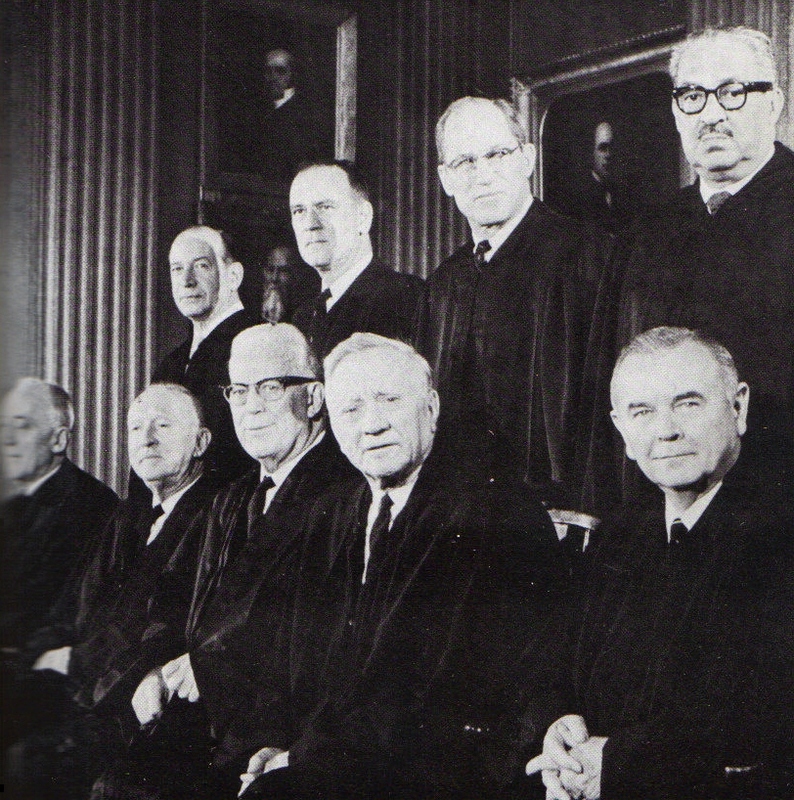 There’s yet another reason we push the Court from its lean to the right since 1970. Overriding this case – going back to Silverthorne and Mapp and an absolute rule would help – and while we’re at it, reversing Citizens United would be a fine start toward reversing the trend economically since 1970 as well. Originally, the exclusionary rule covered more than civil suits against the police, because the exclusionary rule did more than deter the police. Nixon's Gang of Four, along with White and sometimes Stewart, later O Connor, limited the exclusionary rule to the level of civil suits. Now we see that Scalia is limiting exclusion to less than civil suits!